botanical gardens in the world. “Weeeell, Cee-laa-ste. Yeew knooow. Howlden ez jus ful o’ life,” my Dad, in his distinguished West-Texas-slow-as-molasses-slang speaks through the waves of invisible technology across the Atlantic Ocean into my headphones. A tiny fuzzy microphone hovers inches from my smiling mouth. Guglielmo Marconi is rolling in his grave at the ease of communication in the 21st century – thank heavens for Skype. My Dad and I have been talking about my absolute exhaustion of chasing after my little baby boy. For months. “Yew knoow?” my Dad said, after his visit in March, “Ah D-cided that whut Howlen needs is a backyaaarwd.” Thank you for the keen assessment, Daddy. I’ll just order one of those off of Amazon – the UK site is in English, thus more user-friendly, but Amazon.de has free shipping? Ah, I wish the solution was so simple. My Mom visited a few months later. My entire life I’ve heard about what an exhausting child my brother, Jonathan, was, at least, his first 4-years of life. “I walked out of every restaurant in Plano with that boy. . .” she always said, with a tension in her shoulders apparent years later – her vivid recollection of her screaming 3rd born child were never shaken. In the days of pre-child-proof vehicle door locks, it was my job, as passenger in the front seat of our conversion van at the ripe age of six, to hold down the lock to make sure my screaming toddler brother, who had wriggled his way out of his car seat and was now throwing a tantrum on the floorboard, wouldn’t open the door as we barreled down Parker Road in Plano towards home. I agree. But my mom got through it – as strong and as determined as she is. My brother (ahem, after age 4) was awesome, and still is. My mom and brother are close and he was always the kid who most easily made her smile and laugh throughout our childhood. They are a good match. A few weekends ago, my family took a day-trip to Belgium. We near Gent and Holden starts to wriggle and scream. Within seconds, his Houdini-like maneuvers have him free of the shackles of his car seat and he pulls on my husband’s driver-side headrest, attempting to free the lower-half of his body. In our tiny European car, I’m easily able to reach into the backseat, and visions of my mother driving our van involuntarily enter my head. The flashing images trip through my mind, while a chanting mantra of “ignore negative behavior” mesmerizes and desensitizes me. It’s a strange playback of jumbling and uncomfortable thoughts - like that horrible boat ride in the Willy Wonka movie. We arrive in Gent safely. The kids are in awe of the parking garage we’ve entered. I sigh. I’m worlds from where I was, but at the same time, find myself reconnected to my past, as always, in really funny, unexpected ways. and I take turns eating and chasing Holden around the adjoining castle/square/fish market because there’s just no way we’ll subject the other diners to the screaming he amazingly exerts from his tiny body. In the meantime, Cosette asks what’s floating in her drink. I gaze out at my husband, who is chasing our son around the ancient stone fountain. I admire the buildings around us, with labels such as 1640. . . this place is so. . . amazingly historic. . . and I turn to her, wondering how we’ve gotten here – “They’re ice cubes, honey! There are ice cubes in your glass.” My American baby doesn’t know what ice cubes are. Her apple juice has been served to her in a tall glass with a Jack Daniels slogan on it. I’ve been here long enough to shrug at the glass, but not-long-enough to just take a sip to make sure it’s really apple juice. Vinny continues to chase Holden through the cobblestoned-square and I find myself thinking of my mother managing my little brother. 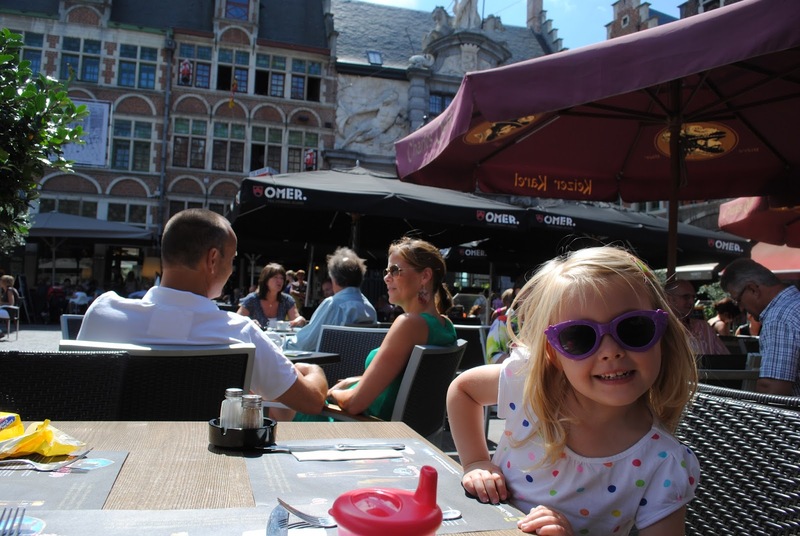 At least a square in Gent is more scenic than the parking lot of the Black-Eyed Pea. 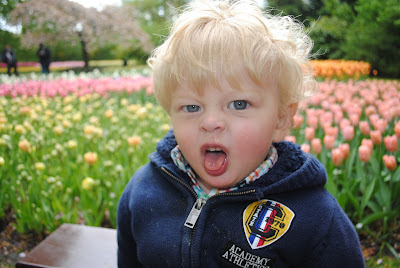 So, with that – I cannot say with certainty what the American daycare did for my daughter as a jump-start to life vs. my son’s upbringing with a full-time Mom in The Netherlands. Girl vs. boy. Work vs. stay-at-home. American vs. Dutch. Or perhaps it’s genetic – Holden is a spitting image of my brother? There are just too many variables, but in the end, I guess it doesn’t really matter. Holden is Holden, my rambunctious baby boy, with a smile and laugh that attracts an international crowd. I’ve had a month of shocking Wednesdays. We enrolled both kids into all-day daycare on Wednesdays a couple of months ago. A whole day all to myself usually resulted in a 5-hour dusting, mopping, vacuuming, laundry, bathroom-scrubbing, glass-cleaning, yard mowing, porch sweeping, and sheet-changing spree. . . to be followed by a couple hours of grocery shopping, errand-running, dinner-preparing, and if I was really efficient, maybe. . . I’d do something crazy, like. . . sit down. Once V returned back from his trip to America, we decided he’d take every Wednesday in July off, so that we’d have the date-days we hadn’t had in. . . well. . . years! I was excited. I wasn’t sure when a week of chores was going to be completed, but I knew that we’d squeeze them in here or there. . . like I did before my sweet baby tornado was enrolled in school one-day a week. The first Wednesday, after a morning of brunch and coffee, we received the mail. That horrible letter sealing our fate shook in my husbands’ sweat-drenched fingertips. “Celeste,” he said, and I knew something was wrong. This was not a ‘honey’ conversation. “What? What is it?” he was pale and clearly upset. This was bad, bad news. I knew from the look on his face, our first ‘date day’ was ruined, with no hope of redemption. The doomed letter in his hands was correspondence from Eneco, our electric and gas provider. I learned something very important that day - The Netherlands utility companies bill customers using an estimated monthly rate, which is calculated by reviewing the prior 12-months usage. At the end of the yearly cycle, the actual and billed usage is compared and the customer either owes money or gets a refund. Because our rental house was empty for years before moving in, the monthly rate we had been paying was a little over half the appropriate amount. We had no idea our monthly rate was under-budget - compared to our Texas utility bill, the figures were already the rate of an electric bill in the heart of summer with 100+ degree heat beating on your roof. The reconciling bill and it’s despairingly large lump-sum total made me cry for an entire day. I contacted the landlord, and apparently, he completely agreed with the rates – I guess he just shrugs at his ridiculously inefficient home. I was shocked, heartbroken, and despondent. I also matter-of-factly-concluded that if utility rates and corresponding taxes were as high in the U.S. as they are in The Netherlands – Americans would be a hell of a lot more energy efficient. It wasn’t necessarily about the money – it was the principal of the bill. I felt like I had traversed strides above the nuisances of living in a foreign country. It had been months since the Dutch-ways had really rocked my boat. Over the past 18-months, I had charted the waters, I was rolling the waves, I was sailing with the wind in my hair and this letter blindly sunk my battleship. I was beyond upset. I felt helpless. I felt out of control. I felt out of tune with my own destiny. I felt victimized and unappreciated. I felt like a fool. And what do I do when I feel all these things? I apply for jobs. I’ve actually applied for quite a few jobs since I’ve been here – with fruitless results. I usually just do it to amuse myself – to confirm that the universe has sent me here to be a full-time Mom. . . and to prove that accounting just really isn’t my thing. I had applied for numerous accounting jobs and after sending my resume (in English), all applications were met with the same response – “We serve our clients in our local language, you need not apply.” The day after we received the electric bill – I felt a determination like I hadn’t before. This wasn’t about the fact that 90% of my mind-numbing daily conversations with my son can be summarized in two phrases: “Sit Down! And Don’t Touch That!” This wasn’t about my complete feeling of inadequacy as a mother to convince my daughter to put her ‘dirties in the toilet,’ after months of trying. Oh no. This wasn’t about a need to escape my daily routine, this was something more. With diligence and purpose, I perused the Expat websites for jobs. I applied for a few accounting positions like usual and without gusto, but then. . . something caught my eye. It was a part-time job – mostly work-from-home, with a requirement to visit the office in Haarlem once per week. They wanted a writer, preferably a communications or journalism major, someone who could edit photos & videos, among other requirements. There was no mention of needing to know Dutch - Their main purpose was to provide information, in English, to Expats, something to which I could definitely relate. Throwing caution to the wind, I sent an email. I explained that while my resume has 10 years of auditing & accounting experience, for the past 18-months, I’ve been putting all my auditing documentation skills to good use by writing stories of our adventures here in The Netherlands. I added a link to our House Hunters International casting video, and of course, the link to my blog. I didn’t even tell V I had applied for it, because I was so sure that I would never hear anything back from them about it. A week later V and I pretended to be Leiden tourists for our 2nd Wednesday date-day. We took a canal cruise through town, complete with headset explaining the history and the sites. 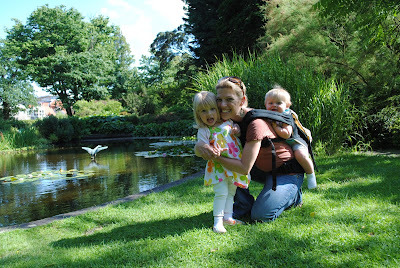 We ate lunch at the botanical garden and strolled among the blooming plants afterwards. This botanical garden is a little special to me – as strange as it sounds, it has provided me guidance in the past. As I held V’s hand, admiring the blooming roses, the burden from the week before still bruised us. We passed ancient trees and inside my head, I asked, please, what are we doing here, what direction is next? But the botanical garden gave me no answers. Not until the phone rang when we got home. V is at his computer (even on vacation days he still must at least send a few emails). It’s about 3 in the afternoon and I’m sitting on the couch, reading a book. The phone rings, which is unusual. Our phone rarely rings. He gets up to answer it and with a confused look, he hands it to me. “Hello?” – I’m just as puzzled as he is. There is a man on the phone. It’s a Dutch man on the phone. As silly as it sounds, I’ve never talked to a Dutch man on the phone – well, except for my father-in-law. Then. I realize WHO it is. “Ah, yes – see. . . you are quite an unusual applicant. . .” and he illustrates the requirements of the job in detail. He asks if I’m still interested, and if so, if I could come in for an interview. Next Wednesday would be fine. I place the phone carefully back on the charger and stare at it with disbelief. “Who was that?” V asks. His voice breaks me out of my trance. I turn to him and smile. Third Wednesday date-day. . . after dropping off the kids, V and I spend the morning sipping coffee, researching the company, and talking about the job. I climb to the top of my closet where my high-heeled shoes have been collecting dust for the past 18-months. I dress in one of my Limited suit skirts and blouse. The outfit is a stark contrast to my typical house-shoes and jeans wardrobe. Unaccustomed to the heels/skirt combo – I practically fall down our steep Dutch stairs on the way out the door. Click, click, click, my heels hobble on the well-worn sidewalk and I see my daughter’s teacher having a lunch break in the grassy field next to the train station. I wave and she smiles back. I can practically read it on her face, “What is that crazy American woman up to now?” V and I hop on the train to Haarlem and traverse through the town towards the office. He kisses me good-luck, I ring the bell, and he scurries around the corner. I have a Cookie Monster figurine in my purse. I’m greeted and led to a large table which is apparently used for lunch, meetings, and interviews. I’m alone in the room for a few minutes and I notice bread crumbs on the table. I nervously brush them off the table with my red file folder. I eye the roll of paper towels, but calculating the distance to the closest trash can – I resist the temptation to use one to clean the table properly. I’m playing Teri Garr’s character from Mr. Mom - the Mom who goes back to work, who is embarrassingly scolded for cutting her boss’ meat into bite-sized pieces and for cleaning-up her co-workers lunch. . . I laugh at myself. As I reach for my pen out of my purse, Cookie wishes me luck. Minutes later, I’m in the midst of an interview. An hour later, I call Vinny, who has been wandering around the Haarlem Grote Markt. “Well?” he says. . . “I have a job!!! Where are you? I’ll meet you there!” We sit in the afternoon sun and have a glass of wine in celebration. “When do you start?” he asks. “Next Wednesday!” I am glowing. Then I remember, “Oh. We were supposed to have date-day in Amsterdam next Wednesday. . .” I trail off. The impossible has happened – I have somewhere to be. He waves the comment it away, he’s so proud of me. Date day week three turns out to be more successful than either of us could have imagined. The following Wednesday, I drop off the kids at daycare, board the train, and head for my 1st day of work. It feels like such a long time since I’ve done this, but yet, it feels (almost) natural once I’m there. I talk a little too excitedly and nervously to my new co-workers, but I guess that’s expected for your first day of work, no matter where you are or what you’re doing. The fourth Wednesday of July, after one full day of work, I traverse the cobblestone streets of Haarlem. On my way back to the station, I pause to admire the Grote Markt church, bikes flying by me, hundreds of people enjoying a cocktail or dinner in the warm late-afternoon sun. 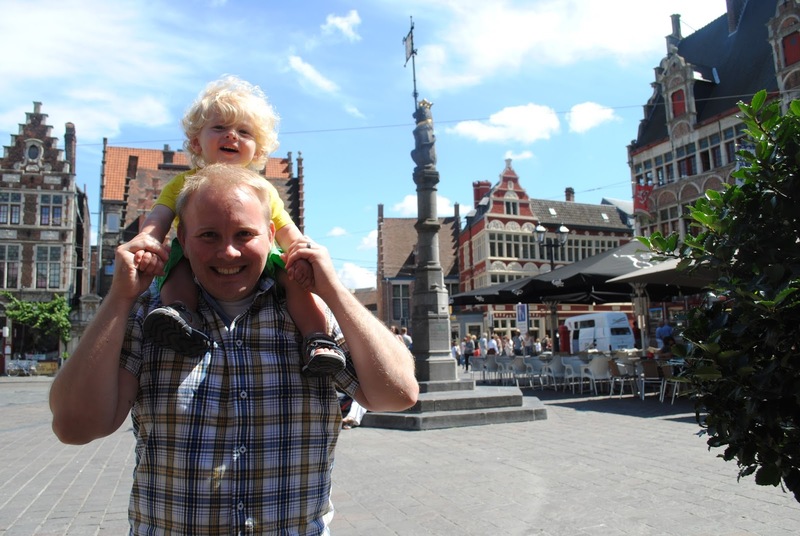 The amazement of it all – a job, in social media, in The Netherlands, that allows me to still spend time with my kids – each item individually would have surprised me, much less all of them combined and I take the moment to appreciate everything. I feel proud of what I had accomplished thus far, and I know this is just the beginning of another journey. July: A month of stress and action, wonder and hope, acceptance and excitement. I’m ready for August and everything it will bring. When a door closes, a window opens. . . Hang on, Little Tomato, things will be alright . . . and happily, all that other stuff. **In celebration of my new adventures as social media coordinator, you can now follow my blog on Twitter (@CourageCrazy)!